The word GOST (Russian: ГОСТ) is an acronym for gosudarstvennyy standart (Russian:государственный стандарт), which means state standard. The GOST standards carry a two-part number, the first of which is a serial number, and the second, to indicate the year of issue, i.e., GOST 1577-70. 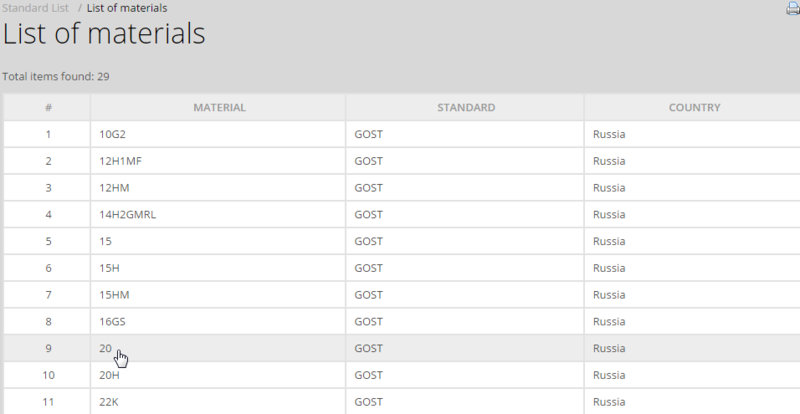 The acronym GOST is still used for the purpose of identification of technical standards that are actively used in Russia and the CIS /Commonwealth of Independent States/. Thus, to distinguish, the official standards of the CIS are called GOSTs. 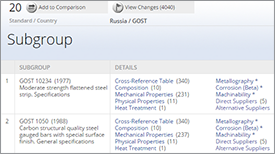 While GOST R is the acronym used by both the national standards of Russia and the Russia's national certification program for products. 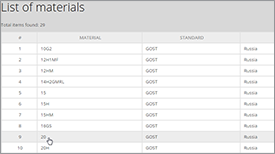 The GOST standards for metals and alloys are somewhat similar to the US ASTM, SAE, or AISI general class specifications. 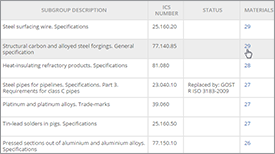 The designations and criteria for individual alloys are grouped under each standard. The GOST standards carry a two-part number, the first of which is a serial number, and the second, to indicate the year of issue, i.e., GOST 1577-70. The serial number is not often changed when a standard is revised, but the indicated year of issue is changed to reflect the date of the latest revision. 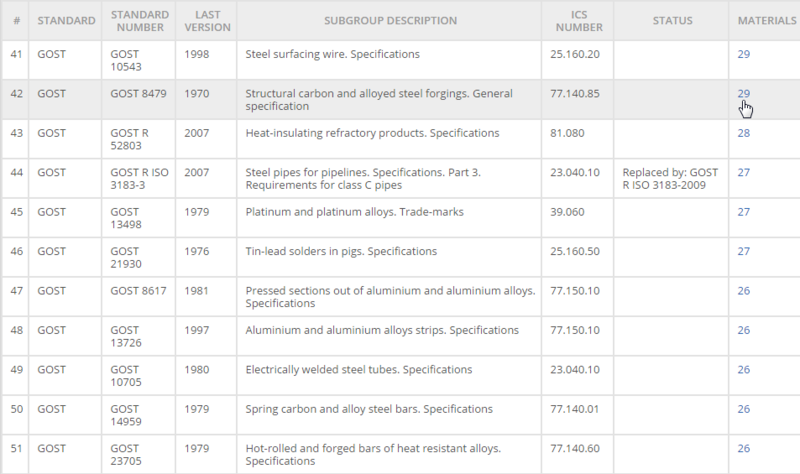 The standard numbers are often indicative of broad fields of intended use (i.e., springs, constructional steels, etc.). Therefore, essentially the same alloy may appear in any number of standards depending on the number of applications it has. 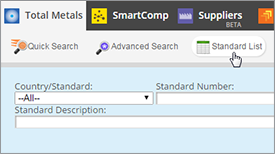 While the GOST composition-designation system is relatively simple and is consistent within each alloy class, there is some overlap between the various alloy classes in regard to what some of the letters stand for. Thus, while M stands for molybdenum in a GOST steel designation, it stands for copper in the GOST aluminum alloy and copper alloy designations. Also, while most GOST designations in the literature are in upper-case letters, extreme care should be exercised to avoid confusion in designations which have both upper and lower case letters in them, i.e., Mts (M4) in GOST aluminum and copper alloy designations signifies manganese, while M (M) alone signifies copper and Ts (W) alone (note that (W) is upper case here) signifies zinc. 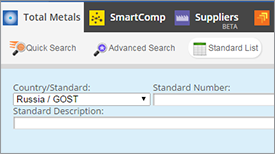 For example, you can review all metal standards from GOST by selecting this SDO from the popup. 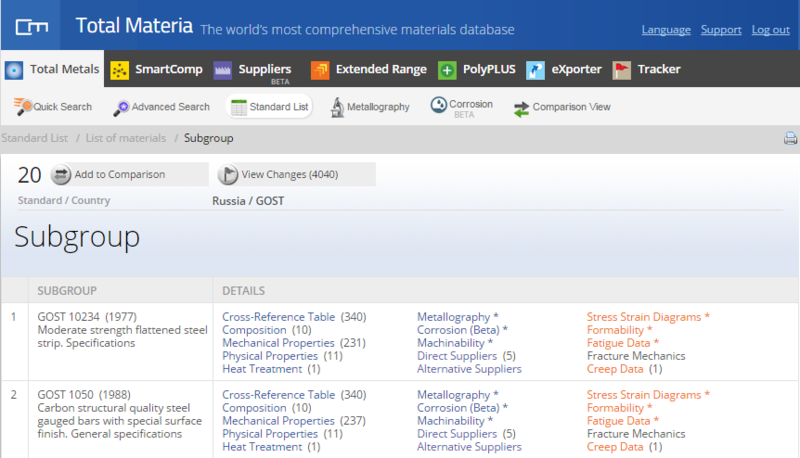 The result list consists of over 1700 GOST metal standards. Information includes: standard description, year of last issue, current status (valid, replaced, etc.) and a hot link to the materials defined by this standard.